We told you back in March the Slate Gray 1970 Porsche 911T that appeared in the opening scenes of Le Mans and was owned by the movie's iconic star would cross the block during auction week in Monterey this month. 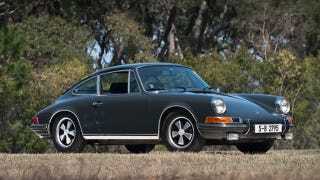 Back then RM's pre-sale estimate for the famous Porsche was between $950,000 and $1.3 million. sold for a total of $1.375 million, about $1.31 million more than a 1970 911T not owned by the king of cool would cost you.